Description: Beautiful 3/2 split plan in with lake view in germantown school district. 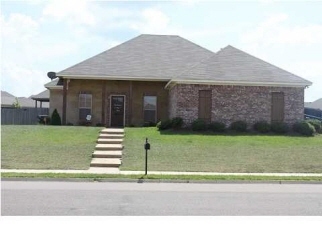 This house features an open floor plan with stained concrete floors in formal dining, living kitchen and master bedroom, master bathroom includes double vanities and a jacuzzi tub with walk in closet. Custom features include tray ceiling in master bedroom, 10ft ceilings, lovely decorative mantle and brick fire place in living, double car garage with extended space. Other features include security system, fenced backyard, and laundry room with extra storage. Come see!! !